I was caught on a rainy, windy night. It was nice and warm, though, which meant there was lots of food out for me to eat. So, I took my chances and came out to eat between rain showers. Several of my pals were also out feeding in the same spot, near the trail leading to Shakespeare in the Park. I’m a really old big brown – my teeth are REALLY worn. But I’m doing pretty well for an old guy – I weighed in at almost 18g! Just like Vik, I’m a high-society bat. I prefer to live in a house or in a tree in someone’s backyard and commute to High Park to eat. I’m still sleeping in the same spot – probably in a tree in someone’s backyard. And I’m still out feeding every night. 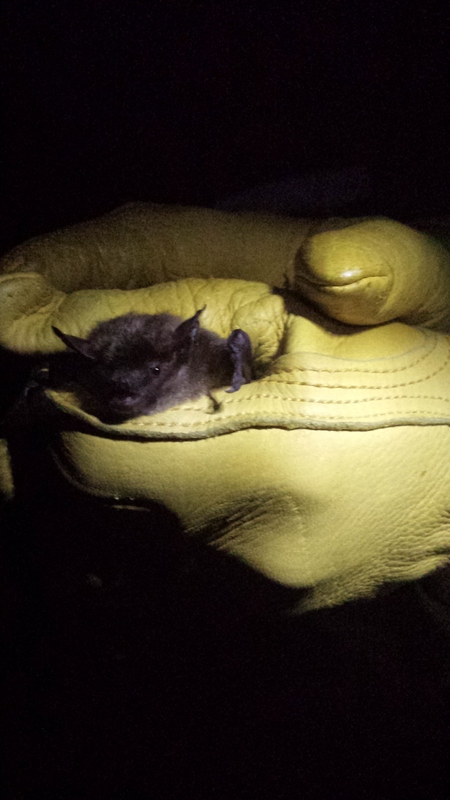 Like all my bat friends, I sure am enjoying these warm nights!